Roof cleaning is the process of removing dirt, algae, and moss from roofs. 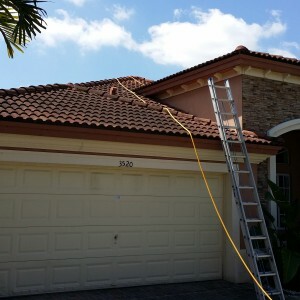 Roof cleaning extends the life of your roof, thus preventing premature re-roofing. A stained roof is not only a cosmetic issue, decreasing the exterior appeal of your home, the algae that grows on your roof slowly spreads, feeding on the limestone filling on the shingles and surrounding moisture. It only takes one spore that gets a good grip on your roof to start the process. This shaves precious years off your roof, accelerating the need for replacement, and hinders the effective deflection of UV rays and heat, coming at great extra expense. This expense could easily be avoided. When discussing the benefits of roof cleaning overall, it’s of equal importance to look into the methods used. High pressure roof cleaning will wreck your roof. Shingles are fragile, being composed of many thousand to tens of thousands tiny granules and, while pressure washing will remove some stains, it will also remove parts of your roof. This would be, of course, counterproductive. Non-pressure chemical methods, or soft washing, are by far the best way to clean your roof. Through these methods, chemicals that are properly diluted are sprayed on the roof. Then, a rinsing process is used to remove any chemicals and residue remaining. These methods ensure that your roof is both protected from damage and restored to its former glory. Our roof cleaning solution contains a mildewcide that prevents mildew from growing back, to give your roof a longer lasting clean. 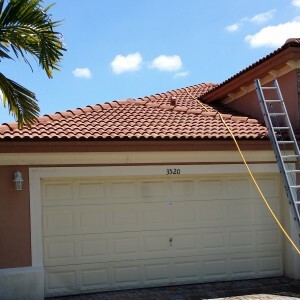 We make your Miami roof look like new again! We use a combination of low pressure and non-toxic chemicals to accomplish this. We use compounded formulas to kill the algae and mold. Mold and debris can take several years off your roof. Contaminants can find their way into the roofing tiles and shingles. Eventually the roofing material itself is contaminated. Very few people know that dead moss, even if sterilized chemically, still holds moisture and speeds a new generation of moss. Our skilled team can remove algae, lichens and moss from your roof. They are feeding on organic materials that accumulate overtime. The longer they remain, the more damage they cause. Algae can infest clay tile, ceramic, cement, fiberglass, asphalt and metal shingles. We can clean your roof in a quarter of the time you could, and much more safely and effectively. We adjust the nozzles and the machine to get just the right pressure. When washing roofs we use cold water and special soft washing nozzles. Your Home Owners Association or your insurance company can cancel your policy if your roof deteriorates to a certain point. These insurance groups know that roof stains and debris, left untreated, will impact the integrity of your roofing structure. It can even lead to rotting wood and mold growth within the home. Remember too, that algae that covers your roof can absorb heat. This increases the cooling costs. Different types of tile require different techniques. If you have terra cotta barrel tile, rotary surface cleaners aren’t used. The technician uses the spray wand to clean the surfaces. Concrete flat tile is very strong. It can be cleaned with a rotary cleaner but the edge of the tile needs to be manually taken care of with the spray wand. With shingle roofs, the technician is trained to spray according to the lay of the materials. He doesn’t spray against the shingle, and therefore doesn’t lift it or damage it. We can improve your curb appeal and actually increase your home’s listing price if it is ready for sale. These are instant results. Don’t be tempted to try this yourself. It’s a job for a professional. Dollar for dollar you’ll achieve the most effective return on your money for any type of home improvement investment.